It took some time to re-acclimatize after a month in the mountains. Berlin is grey and dreary, actually not that bad weather to be sat at the computer planning the foraging calendar for 2014. As announced on the shiny new Facebook page, I will be offering foraging courses, walks, workshops and events for the duration of the year. I am excited about stuff like foraged business cards and terrified about stuff like foraged business plans. There is simply no other way to expand and explore the possibilities of foraging here without consolidating my energy within it. I look forward to the experience of this adventure as it unfolds. So there has been a lot of administrative stuff and not a lot of actual foraging. The ominous march to the blasted heath to collect sea buckthorn is still a week or two away. Luckily, the sloes were still faithfully on the branch as I came back down from the mountains of Valais. When the winter is interrupted by a promising warm spell only to plunge into cold again, this usually spells doom for many wild stone fruit. Despite that, this year there has provided a great haul. If you happened to stumble across the blog this time last year, you may have read about my discontent that sloes tended to get a bit neglected in terms of their uses. Since then we have gone full circle, and to process the abundance of sloes in interesting ways, I have experimented with traditional foraged recipes, while producing a few foraging-meets-delicatessen variants of my own. 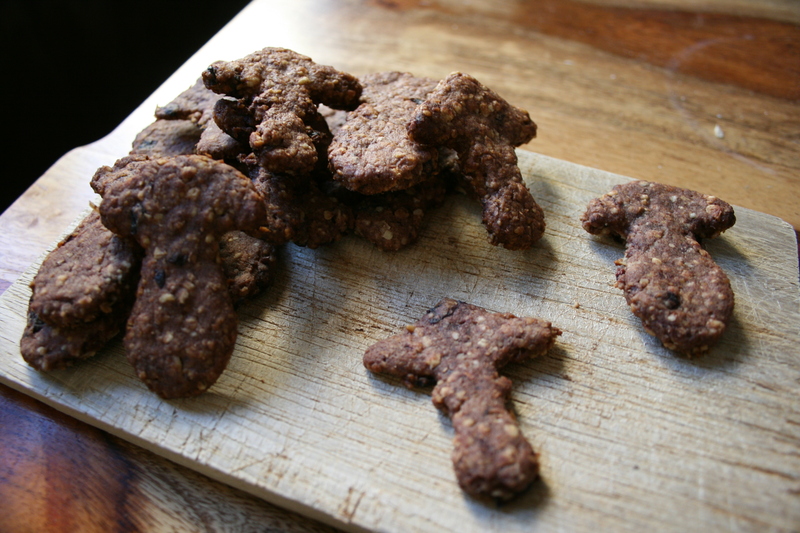 The first of five is a repeat of last year’s blackthorn biscuits, this time produced with mushroom-shaped cookie cutters bought on the flea-market. The one that’s not supposed to be a penny bun is either a stylized parasol, or, if the intention was right, a mature Amanita. Strange choice of mushroom for a cookie cutter, in that case! Experiment number two was a slight variant on the sloe gin recipe. 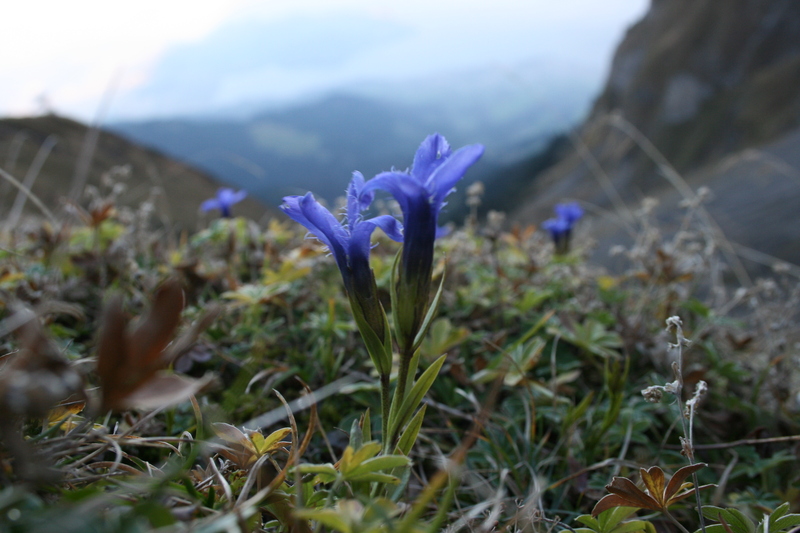 Over in Valais this winter I often found lonely juniper bushes on my walks in the mountains. 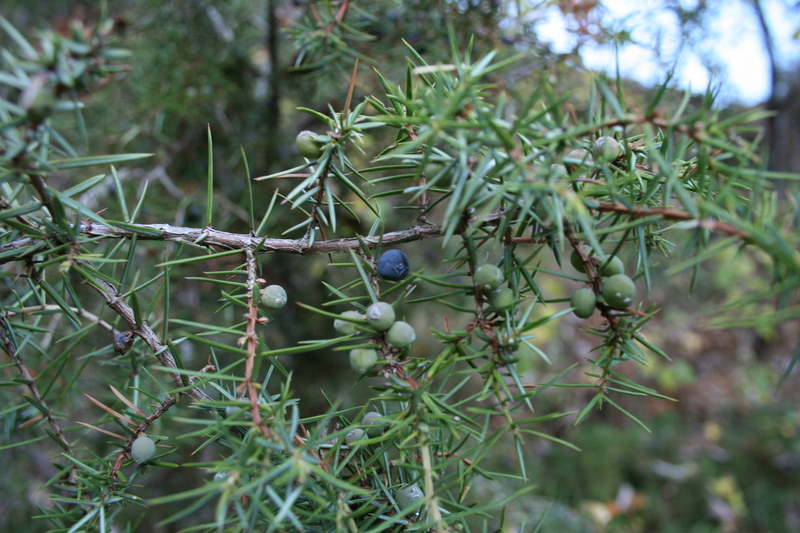 The berries of juniper take two years to mature, but even so I never found a shrub above 6,000ft bearing berries. At lower altitudes they were regularly pretty-well laden, and I took as many as I could before the snow crept down from the peaks (a phenomenon I often watched over the course of the day. Another natural quirk was that as late as December on the mountain the elderberries were still hanging in heavy clusters. Suddenly, on one day, there was a shrill chirping as the jackdaws came down from the extreme colds of the peaks. They stripped the elderberries in one sitting, flitted about a bit to ease digestion, and flew on down to lower climes). Using Shetland gin as the basis for sloe gin, you already have a strong aromatic flavour to work with. The only problem is that producing upwards of 5l (or any amount you’re likely to be fine sharing with anyone), this becomes an expensive little production, 5l costing 157€, the cheapest I can get it here in Germany. I chose to go for a quality gin without the Shetland tag, and to infuse the alpine juniper in the mix to provide the extra flavour. Not stirring the gin, it was possible to see the essential juniper oils leaching out from the berries. The scent of the gin has improved greatly. All the same, back in with the cork, and I’ll report on its virtues in summer. 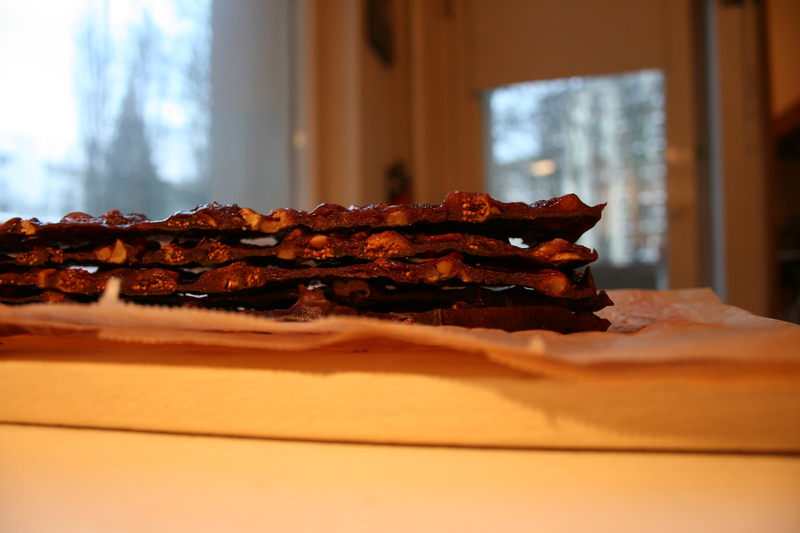 The third experiment is a fruit leather recipe to celebrate one of my strangest memories of working on the alpine farm – harvesting quinces at the edge of a gorge. The farmer’s solitary quince tree had borne fruit for the first time, and there were nine sizeable fruits to pick. The tree was at the top of a snow-drifted slope running down to the mouth of the gorge. Each time I picked a quince, the next one on the branch would come loose, start barrelling down the slope, and I had to dive and ‘ski’ after it as fast as I could. I fumbled almost every fruit and had to go back downhill with the grace of Eddie the Eagle. The pastoral Valais version on the Sisyphus myth. Pit about three cups of sloes and put them in a pan with a heavy base. Add to this three cups of quinces, or, if you can’t get hold of them, the most fragrant cooking apples you can find. 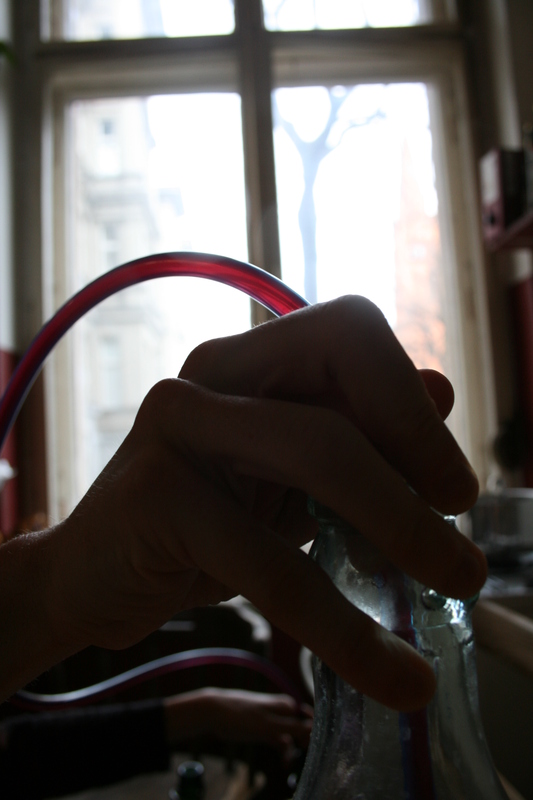 Keep the cores and pack them into a large tea-strainer, add this to the mix. Boil this up with as little water as your pan can deal with, and add honey or sugar to taste. Leave the lid off. When the mixture is completely mushy, remove the strainer, blend the mix, take it off the heat and allow to cool. Add nuts and dried fruits, about three cups in total, and mix well. Pour the contents onto a parchment paper-lined tray, smear the mix as thin as possible, and place it in the oven on the lowest setting, with the door open, overnight. When fully dry, cut into slices or roll the whole sheet up into a baton. The fourth is a way to turn sloe juice into something quite special, a kind of savoury jus that has spice, sweetness, acidity, and a bit of the old umami too. Use it like Worcester sauce. Boil up three cupfuls of sloes and sweat them with the pan lid on until tender. Add to this four cupfuls of white wine or apple cider vinegar. Keep boiling. In a frying pan, strain a drop of this mix and heat, adding to it two cupfuls of finely shaven shallots. Cover and heat. When this is looking like a balsamic reduction of onions, add it to the main pan. Now haul out your most stomach-ulcer generating spices. I went for ras el-hanout (Moroccan spice mix including paprika, tumeric, pepper, fenugreek, and coriander), allspice, cloves, mixed peppercorns, and shredded ginger. Add these to the mix and stew on a low heat for as long as possible. The jus will hopefully reduce a little. Now taste. If it is inhumanely piquant then add a teaspoon of brown sugar – but don’t over-sweeten it; you’ll be using it in small doses. 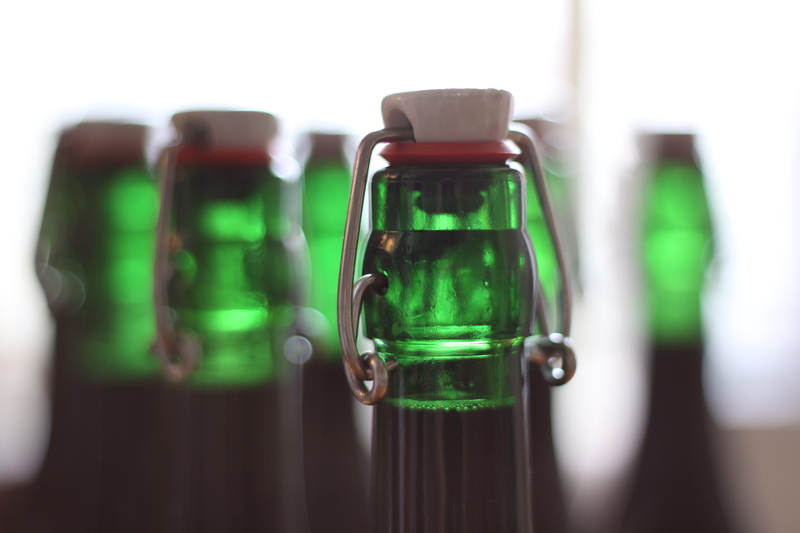 Strain the finished jus into a sterilized bottle, allowing it to cool before you cap it. Do not throw away the stewed shallots – eat them bruschetta-style bristling with spices and all, and a bit of soured cream. And, as luck would have it, experiment the fifth is not yet finished, and is still gurgling away happily to itself, taking its sweet time. I imagine it will still be fermenting into the new year, but actually it’s a race against time to find enough of my favourite half-litre swing-top bottles to rack it off into, so perhaps the timing couldn’t be better right now. So, until the night calls me out to bring in the sea buckthorn, that’s the extent of my research with the fruits of the forager’s winter. Until then, a Happy New Year to all. 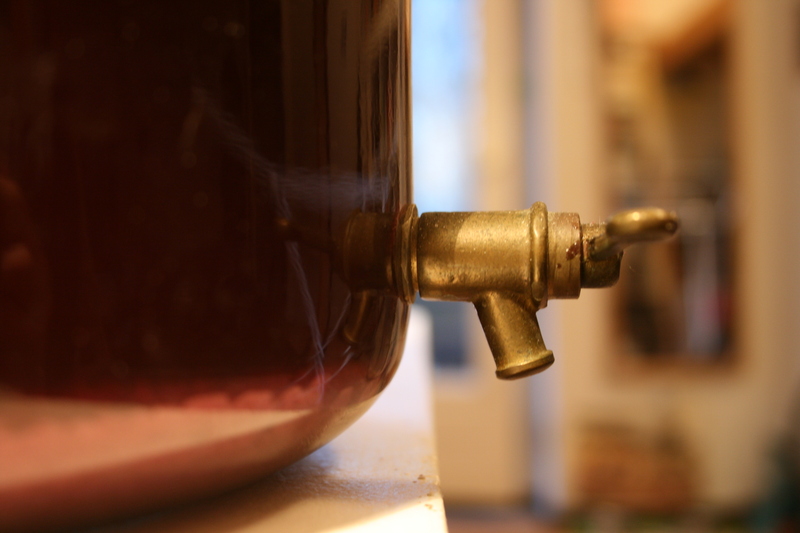 The sloe wine finally stopped fermenting, and was ready for bottling. I managed to finish up with exactly eight half-litre bottles, having added about 300ml to the original must so as not to take up the sediment and all into the last bottle. The young wine was buoyant and strong, so I didn’t prime the bottles on racking it off. I’ll give them a bit of time to round the flavours off. While that’s happening, I’ll have a new batch brewing to stagger things out. The fermentation was ‘gentle’ but consistent, and I think I will be easing a little pressure from each bottle twice a week just to be safe. 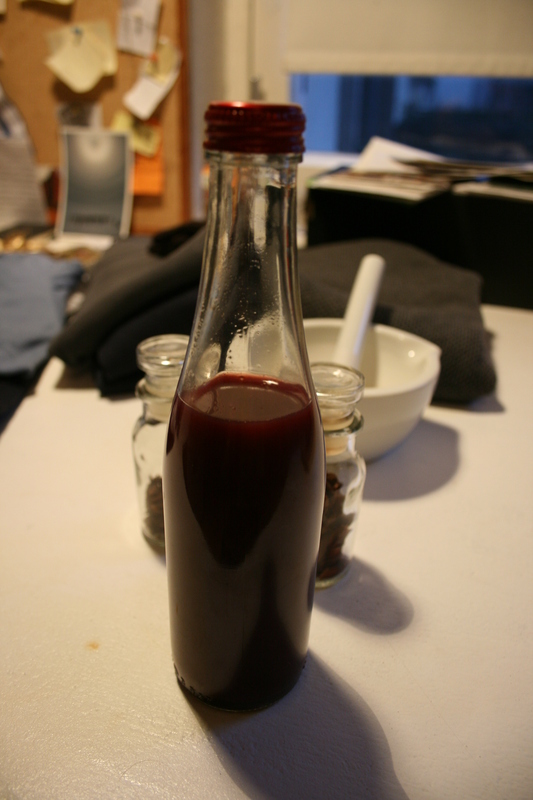 A very easy and relatively ‘pure’ foraged wine – just water, sloes, sugar, citric acid of some sort, and yeast. Lovely stuff. 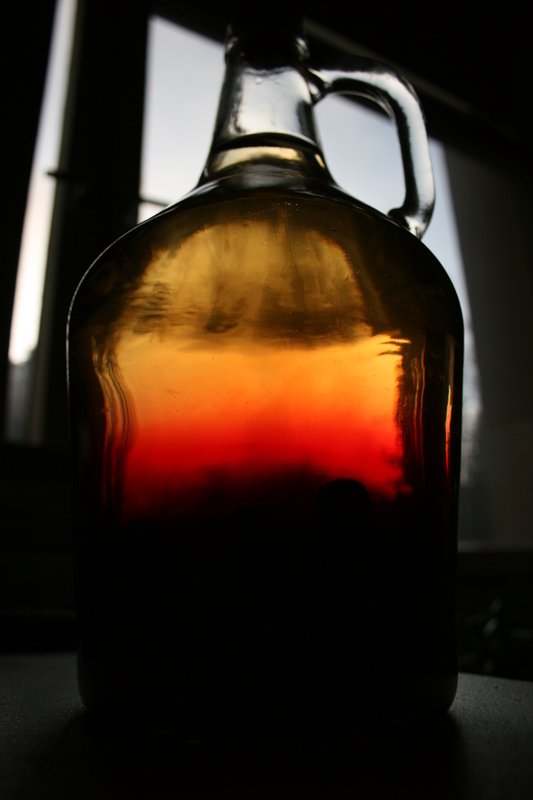 I am planning on doing some home brewing of my own in the future. I have been of late, speaking to my wife about the possibility (when we move to fecund Jeju) of growing tea and then producing our own tea. Green tea grows abundantly there due to Jeju’s balanced blend of wet and warm. I will have a couple of tea trees and do some experimenting, off in the future, but a potential. I also want to start fomenting my own makkoli, a very pure and delicious Korean rice wine. Using choicest Jeju oranges, I want to make Jeju orange Makkoli. Just a matter of a bit of research and some spare spongles to invest in the necessary equipment, all in the lamp light of the future. It ain’t no foraging but I am able to get hold of organic rice grown in the mountains and home made kimchi to make stew with, plus pork, which is of such a remarkable quality. Can’t skimp on the diet, just rice, kimchi stew, tea and makkoli for this fella. I am certain you would love the Korean diet.